Each day, Papa Duck goes out with his ducklings but on Monday only four come back, on Tuesday only three, but on Saturday all return when he calls and on Sunday, they stay home and rest. 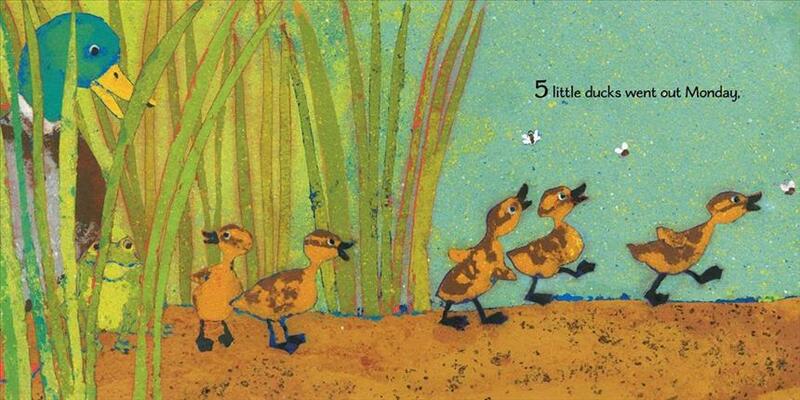 Booklist - 10/15/2016 Papa Duck and his five little ducklings go out to play on Monday, marching “through the woods and far away,” until one goes missing. Tuesday through Friday additional ducklings disappear, despite Papa’s persistent quacking for their return. Luckily, on Saturday they all return safe and sound. On Sunday all are ready to go again, until Mama Duck insists that everyone take a day to rest. Fleming’s version of this familiar finger play features her signature pulp-painting artwork, hued predominantly in blues and greens that contrast nicely with the mallards’ brown bodies. The illustrations become an alternate narrative of sorts, detailing the other creatures the birds encounter, and suggesting the sources of the fledglings’ distractions. A final spread offers additional information about mallards and the other key characters (frogs, flying squirrels, wild turkeys, box turtles, pigs, and a young child) and identifies the other depicted animals. This is a natural fit for toddler story hours or one-on-one sharing; the inclusion of a male primary caregiver is an added bonus. - Copyright 2016 Booklist. School Library Journal - 10/01/2016 PreS-Gr 1—This stunning version of the familiar children's song features a quacking father duck and ducklings who travel not just "over the hill" but "through the woods," "past the paddock," "across the fields," and "down the road" on successive days of the week. By Saturday all are gone until they heed sad Papa Duck's final "quack, quack, quack!" and come running home. On Sunday, Mama Duck suggests that the family rest. Fleming's signature pulp paper paintings bleed to the edges of every spread, providing vibrant textured backdrops for the ducks' adventures. In a brilliant use of color to represent various environments and temperatures, her speckled skies change from the cool blues of the pond to deep forest green to bright blue and then the yellow of a sun-hot day on the farm. Several creatures, including a less familiar flying squirrel, share scenes with the ducks, and some appear repeatedly. A huge, multicolored turkey spills over two pages, as do a group of pigs contentedly wallowing in mud. Papa Duck's wings are outstretched to welcome his little wanderers just back from their final encounter—charming young Anna in her wading pool. VERDICT Large, repetitive text that invites participation; the opportunity to learn the days of the week; and interesting back matter that contains brief information about the ducks and other animals in the book make this a great storytime choice for all libraries.—Marianne Saccardi, Children's Literature Consultant, Cambridge, MA - Copyright 2016 Publishers Weekly, Library Journal and/or School Library Journal used with permission. Bulletin for the Center... - 01/01/2017 In what might be called a decumulative story, a set of sibling ducklings goes out each day and returns with one fewer duck every time. That’s a slightly ominous tale for the perky rhyming text, but the art reveals the playful reason behind it: each day one duckling falls in with another species of animal, so one tries out being a flying squirrel, another a wild turkey, and so on, with the last little duckling ending up in a wading pool with a little girl; the next day all the babies come back home. 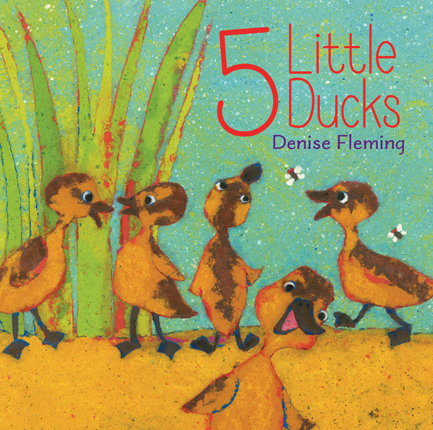 The book cleverly incorporates several concepts along the way-numbers from 1-5, days of the week, and animal ID-without pulling focus from the lively duck story. Fleming’s inimitable fiber art retains its usual luxuriant tones in the full spreads; while the high saturation means that sometimes there isn’t much contrast between ducklings and their surroundings, the resulting seek-and-find element is in keeping with the book’s approach, since kids will be puzzling out what each duckling is up to anyway. Compositions are skillfully varied, and colorways range from the rosy pink and chocolate brown of the pig wallow to the lemony sunshine of a bright morning. Animal lovers will especially warm to this multipurpose storytime treat. DS - Copyright 2017 The Board of Trustees of the University of Illinois.